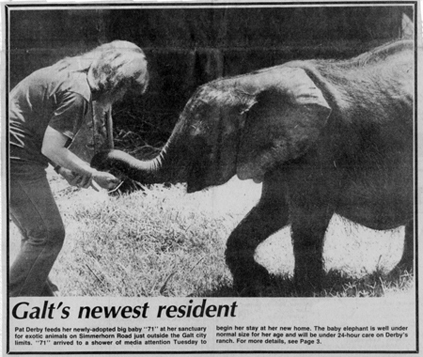 ABOVE: 1986 - Pat Derby with PAWS' first elephant, 71, shortly after the baby elephant's arrival at our Galt Sanctuary. PAWS A Quick History. . . The Performing Animal Welfare Society (PAWS) captive wildlife sanctuaries are places where abandoned, abused, or retired performing animals and victims of the exotic animal trade can live in peace and dignity. For more than 25 years PAWS has been at the forefront of efforts to rescue and provide appropriate, humane sanctuary for animals who have been the victims of the exotic and performing animal trades. PAWS investigates reports of abused performing and exotic animals, documents cruelty and assists in investigations and prosecutions by regulatory agencies to alleviate the suffering of captive wildlife. 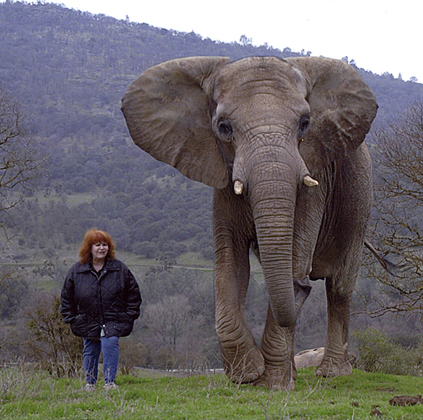 Founded in 1984, by former Hollywood animal trainer and author, Pat Derby, and her partner, Ed Stewart, PAWS maintains three sanctuaries for captive wildlife in Northern California. The original PAWS SANCTUARY, comprised of 30 acres in Galt, California, is a haven of treasured memories and senior residents enjoying their Golden years, oblivious to the passing of time. As preparations continue with construction of new animal habitats and the relocation of the remaining animals from the Galt facility to the expanded 2,300-acre ARK 2000 sanctuary in San Andreas, PAWS hosted its final Galt Sanctuary open house on May 21, 2011. The AMANDA BLAKE MEMORIAL WILDLIFE REFUGE, 100 acres in Herald, California, established in Ms. Blake's memory, provides refuge for emu, rhea, fallow deer, eland, Muntjack deer and a herd of scimitar-horned oryx. Through this sanctuary, PAWS continues Amanda's commitment to the protection of animals in captivity as well as in the wild. ARK 2000, 2,300 acres of pristine, natural habitat in San Andreas, California. ARK 2000 is currently home to elephants, lions, bears and tigers. The story of PAWS began when co-founder, Pat Derby, worked with exotic animals as a trainer on the set of many popular television shows in the 1970s ("Flipper", "Daktari", "Gunsmoke", "Lassie", "Gentle Ben") and other animal films. 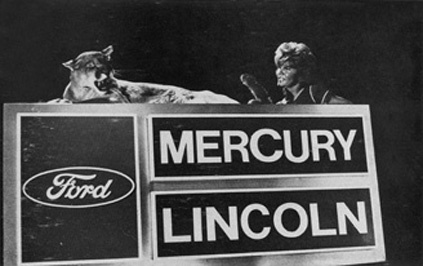 She was also the trainer and spokesperson for famed Lincoln Mercury "Sign of the Cat" car commercial cougars - Chauncey and Christopher. In the process of developing her own training methods based on trust and love instead of fear, Pat was shocked to discover a profession rampant with neglect and abuse. Her autobiography, "The Lady and Her Tiger" (Dutton 1976), was the first expose of the harsh training methods and minimal care which were standard in the entertainment industry. It was during this time that Ms. Derby met Ed Stewart and retired her animals, but stories of abusive training on movie and television sets prompted them to advocate for legislation which would mandate better standards of care and handling for captive wildlife. Pat Derby has appeared on "Entertainment Tonight", "The Crusaders", "Inside Edition", "Nightline", "Inside America's Courts", "The World's Most Dangerous Animals", "Dateline", "20/20", "Animal Planet", "The Leeza Show", "Montel Williams", " The Today Show", "CBS Evening News", "The Fine Living Network", "Animal Planet", "PBS Television" and other local and national television news and radio programs educating the public on the need to protect wildlife habitat and to control captive breeding of exotic animal species. Pat Derby and Ed Stewart have pioneered a method of elephant handling that uses NO bull hooks, weapons or aversive training techniques. PAWS was the first facility to use this "non-dominance" technique successfully, and since 1985, the work of Derby and Stewart has been a model for elephant handlers around the world. PAWS also protects wild species and their habitat with international programs established in India, Mexico, Africa and Cambodia to diminish human/elephant conflict and to establish protected areas for wildlife. Ed Stewart is currently an advisory board member for Elephant Haven, a European elephant sanctuary. Pat Derby died peacefully, on the night of February 15, 2013, in her home at ARK 2000. Ed Stewart, her partner of 37 years, was by her side. It's impossible for any of us to imagine life without Pat Derby — PAWS without Pat Derby — but she chose, and trained, her support team well, and under the leadership of Ed Stewart, Pat's dreams and visions will be kept alive, her advocacy for animals will continue and PAWS will move forward. We'll miss her fire, determination and fearlessness; her intelligence and her passion. We'll miss her sense of humor. We'll just miss her, period.